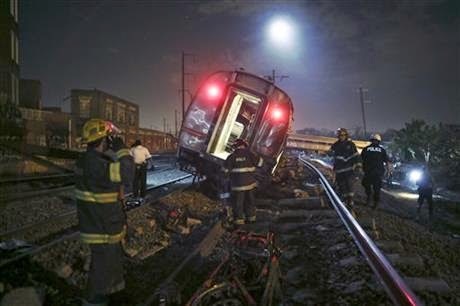 The Friends of the Flange : Amtrak 188 has derailed. Are we listening? Amtrak 188 has derailed. Are we listening? Update: The latest news indicates that crash may be related to excessive speed, and the death toll has raised to 7. Go up to any railfan, and ask why they like trains. You're going to get an answer like "they're big" or "they're fast" or "they get me to work." These are pretty ready answers but they get at something more philosophical and harder to articulate. We like these things about trains because they're the tip of the iceberg, the visible hints of just how much kinetic energy a train displaces when it's moving at full speed--even at low speed, by right of it's sheer size. We get hints of it, when we feel the ground tremble under our feet, or hear the rumble of a fully loaded freight from miles off. You can experience those things and get a fuzzy understanding of just how much power is there, in the same way that some really hard thought about basic algebra might give you some conception of how the mathematics of advanced physics works. You get just enough to know how much you aren't experiencing. I wonder how many of us who like/work on/frequently ride trains sit down and think about just how much of a balancing act the whole thing is. Try wrapping your head around it--tens of thousands of pounds resting on eight(or fewer) tiny points of contact per car, moving upwards of fifty miles per hour. It's easy to forget that almost two centuries of engineering has gone into the railroads now, and that the whole thing doesn't run on faith. You could be forgiven for thinking you're going to end up in the ditch the moment you close your eyes and stop wiling the train to stay on the tracks. What truly is amazing, and frightening, is that where human error isn't involved, it's often microscopic flaws or statistically unimaginable chains of events that end up causing the worst crashes. The ICE wreck in Germany was caused by a hairline crack in a badly designed wheel. Another mid-20th century crash in France resulted from a thin layer of ice preventing a track signal from communicating with the locomotive crew. The Wenzhou collision in China resulted from a lightning strike shorting out part of the signaling system. That terrible accidents don't happen with more frequency is a testament both to the watchful eyes of the men and women working to keep the railroads in good condition and running safely, a living bulwark against uncertainty, and the fact that the railroad industry is one that grew up soaked in blood. That the death toll in the Amtrak collision last night is only 6 isn't luck--the designers of those coaches learned to make them safer after looking at the wreckage of previous incidents. What we're seeing on the news about that crash is the stuff of nightmares, especially for those of us who work in passenger service. It's the nature of a train in its rawest form, momentum freed of any restraint. The unfortunate people within and close enough to witness the crash have an unwanted and intimate understanding of exactly how much potential for chaos can lurk inside of ordinary things, that sometimes there's just a tiny flaw waiting to throw us from from monotony into disaster. As of this posting, the NTSB has only been on the site of the accident for about an hour. It's far too early for the authorities to give any insights into the nature of the cause, other than to speculate that they do not, at this point, suspect terrorism. Any one of the usual suspects might be found to be at fault--faulty signaling, driver inattention, stupidity on the part of the public, or generally poor condition of the tracks. There may or may not be any fault to be found: One of the ugly realities of railroading is that sometimes, despite an impeccable performance by the crew and pristine maintenance-of-way, accidents still happen. Their cause is completely removed from human control. What I am picking up in the coverage and discussion of this event, though, is an undercurrent that an incident of this magnitude was bound to happen. It was just deserts to some, after letting our infrastructure rot, and given the frequency with which freight trains have derailed in the last few years, it was only a matter of time before a catastrophic passenger train incident. To others, it was proof that our passenger rail system is ailing, inefficient, and a poor use of taxpayer money. I suspect--I'll go as far as to say that I hope--that this incident will be the thing that prompts us as a country, to take a hard look at our passenger rail industry and our rail infrastructure as a whole. Sometimes it takes an actual wound to drive home that one's surroundings are unsafe. In this case, it's at least five dead and several coaches crumpled up like discarded tinfoil. If there's any lesson that can be taken away from the event at this point, before the details are known, it's that people should keep talking, and keep questioning the state of our railroad infrastructure. We don't have to put up with the conditions they are in now.